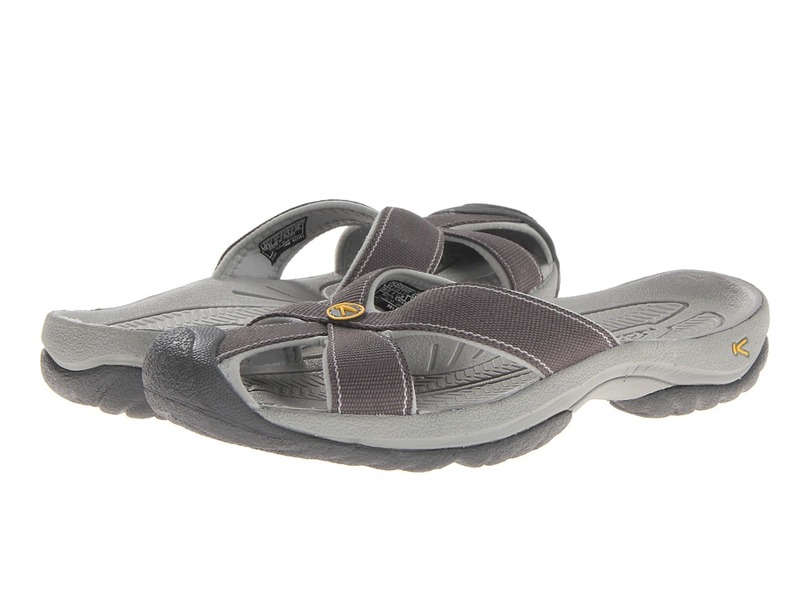 Feel like you~re on vacation every day with the Bali sandal from Keen! Quick-drying polyester webbing straps. Hydrophobic mesh lining quickly moves away moisture away from the skin. Metatomical low durometer EVA footbed. Compression molded EVA midsole provides added shock absorption and support. Patented toe protection. Open-back design. Non-marking, two-part, lightweight carbon rubber outsole. Imported. Measurements: Weight: 6 oz Product measurements were taken using size 6, width A - Narrow. Please note that measurements may vary by size. Weight of footwear is based on single item, not the pair. Please be advised that the Birkenstock&amp#174 Narrow width accommodates both traditional narrow and medium widths. Enjoy easy stylin~ with the Arizona slip-on sandal from Birkenstock. Made of acrylic and polyamide felt fibers, this material is a soft fabric with a smooth leather-like finish. Two top straps with buckle closures for an adjustable fit. Raised toe bar is designed to encourage the natural gripping motion of your feet, exercising your legs and aiding circulation. The suede lined, contoured footbed will mold to the shape of your foot creating a custom footbed that supports and cradles you each and every step. Anatomically correct cork footbed, crafted from cork that is 100 percent renewable and sustainable, encourages foot health. Dual layer Jute: top wicks away moisture while the bottom adds strength and makes resoling easy. Neutral heel profile and deep heel cup keeps the natural padding of your foot where it belongs, under the heel, distributing your body weight more evenly. Flexible EVA outsole offers lightweight, shock absorbing support with lasting durability. Heat Warning - Cork footbeds or EVA soles can be damaged by exposure to concentrated heat. Do not leave your footwear in direct sunlight or in closed cars on warm days. If your footwear becomes wet, allow it to air dry slowly, away from direct heat. Made in Germany. Measurements: Weight: 7 oz Product measurements were taken using size 37 (US Women~s 6-6.5), width Narrow. Please note that measurements may vary by size. Weight of footwear is based on single item, not the pair. Performance sports sandal in a fresh design. Nubuck leather upper with stretch fit textile lining. Triple hook-and-loop straps strategically placed for custom fit. Dual density footbed for added comfort. Moderate arch support provides supportive cushioning for all-day comfort. Direct injected PU midsole featuring full length Receptor Technology. Flexible rubber outsole. Imported. Measurements: Heel Height: 1 3 8 in Weight: 10 oz Product measurements were taken using size 39 (US Women~s 8-8.5), width B - Medium. Please note that measurements may vary by size. Weight of footwear is based on a single item, not a pair. Designed with all the quality and durability you expect from Timberland&amp#174, with comfort technology that keeps your feet comfortable all day long. 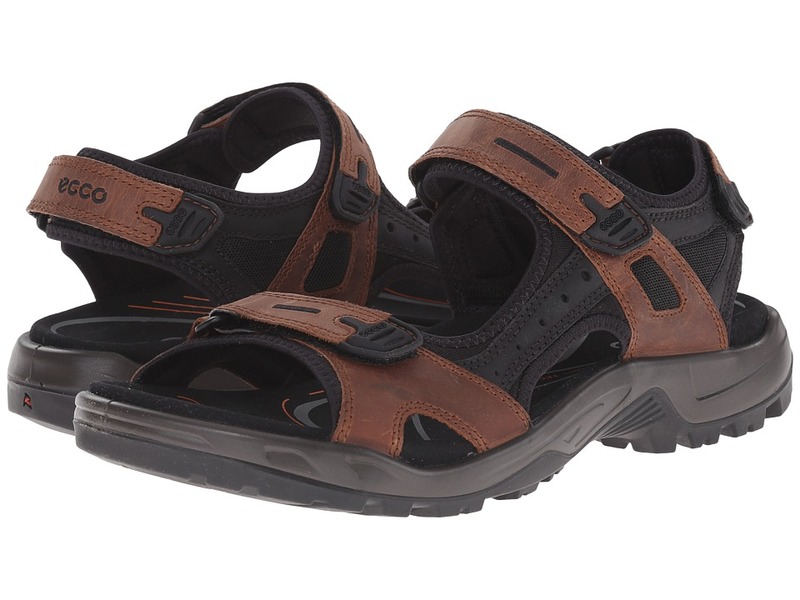 These rugged and ready sandals are ready for whatever path you follow. Full-grain leather or smooth nubuck uppers for comfort, durability and abrasion-resistance. Smart Comfort system technology for all-day comfort and support. Polyurethane midsole for maximum support. Removable orthotic provides support and comfort. Contoured footbed for heel and arch support. Climate control lining for breathability. A polished alternative for casual days or evenings. Measurements: Heel Height: 1 1 4 in Weight: 1 lb 2 oz Platform Height: 1 2 in Product measurements were taken using size 8.5, width D - Medium. Please note that measurements may vary by size. Weight of footwear is based on single item, not the pair. The Rachel sandal is from the Naot Elegant Collection, which runs as a Narrow-to-Medium width. 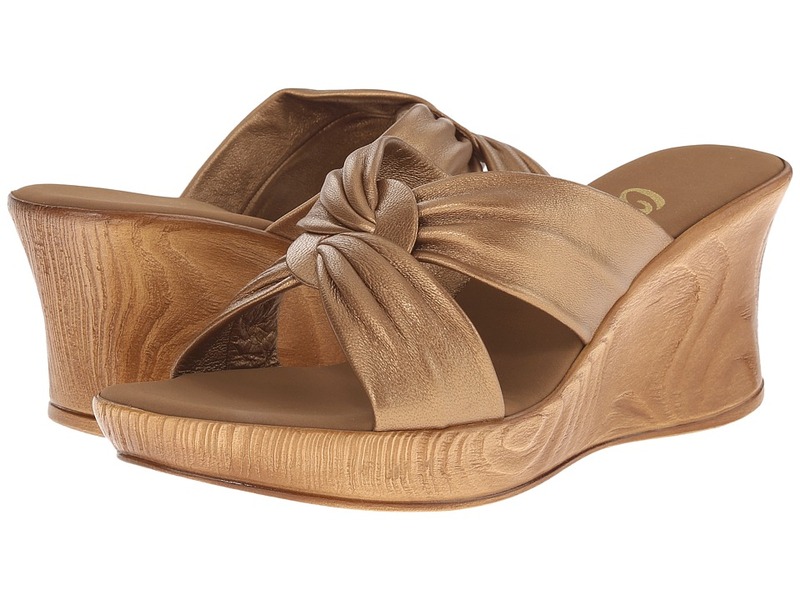 Rachel is an adorable sandal with a sweet, flower-like design that~s just perfect for Spring! 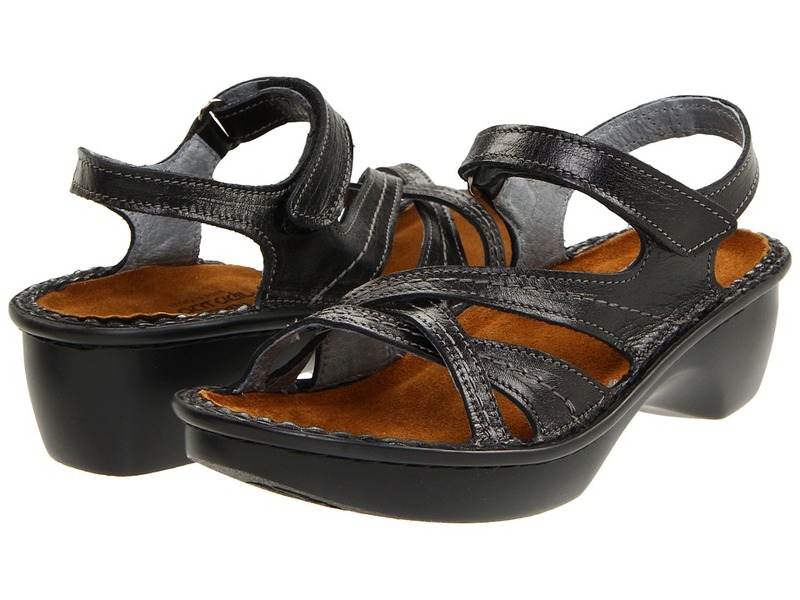 Full leather upper has lovely contrast stitching with adjustable hook and loop ankle strap. Insole adjusts to your feet like a footprint in the sand. This alignment improves within a short time so the feeling of comfort increases as time passes. Anatomical support distributes the weight of the body equally over the entire foot massaging and releasing pressures caused by other parts of the body. Flexible, shock-absorbent sole enables the foot to move gently and continuously. Measurements: Heel Height: 1 3 4 in Weight: 7 oz Platform Height: 1 in Product measurements were taken using size 39 (US Women~s 8), width M. Please note that measurements may vary by size. Weight of footwear is based on single item, not the pair. It is recommended that you order 1/2 to 1 full size larger than your usual size. 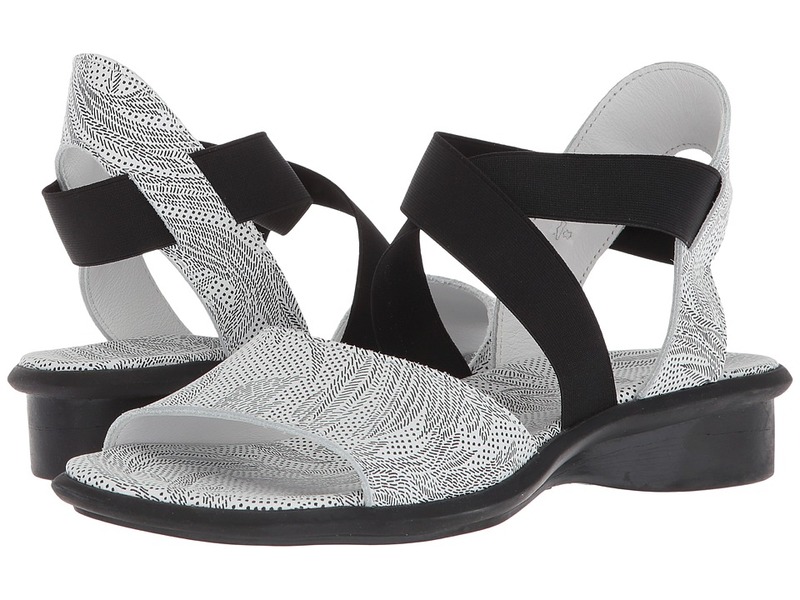 These gorgeous sandals are perfect for sunny days and balmy nights. Butter soft leather upper. 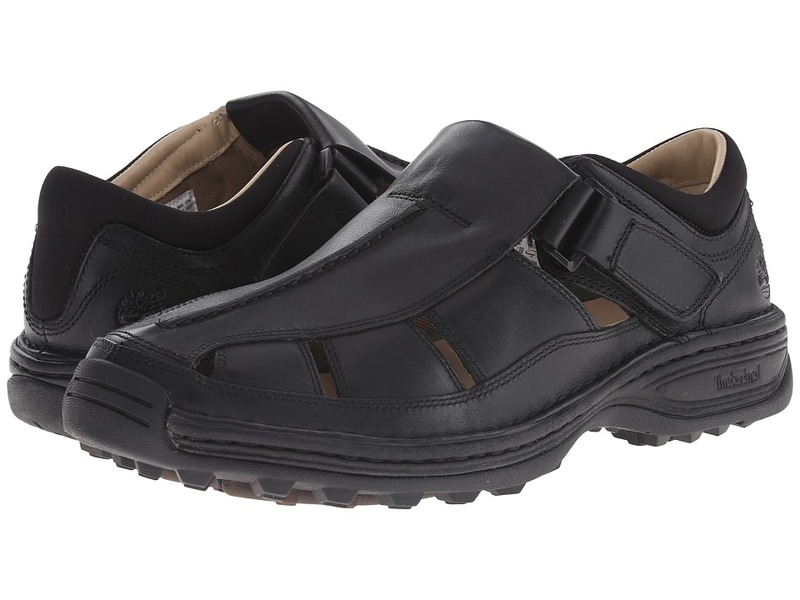 Padded footbed for extra comfort. Platform sole. Made in U.S.A. Measurements: Heel Height: 2 3 4 in Weight: 8 oz Platform Height: 1 in Product measurements were taken using size 7, width M. Please note that measurements may vary by size. Weight of footwear is based on single item, not the pair. He~ll definitely develop a crush on you when he sees you in these fabulous sandals! Thong-style construction. Fabric webbing upper. Please note that the logo tag may vary in color. Thick platform EVA sole for added comfort. Imported. Measurements: Heel Height: 3 in Weight: 7 oz Platform Height: 1 3 4 in Product measurements were taken using size 10, width M. Please note that measurements may vary by size. Weight of footwear is based on single item, not the pair. An invitingly cozy sandal that still pays attention to the demands of style. Nubuck upper equipped with elastic straps to ensure flexibility and a snug fit. Cushioned and leather lined insole. Rubber outsole. Measurements: Heel Height: 1 1 2 in Weight: 8 oz Product measurements were taken using size 38 (US Women~s 7), width M. Please note that measurements may vary by size. Weight of footwear is based on single item, not the pair. Reef sandals have never been so comfortable than the Fanning, a classic staple of supreme beachside style! 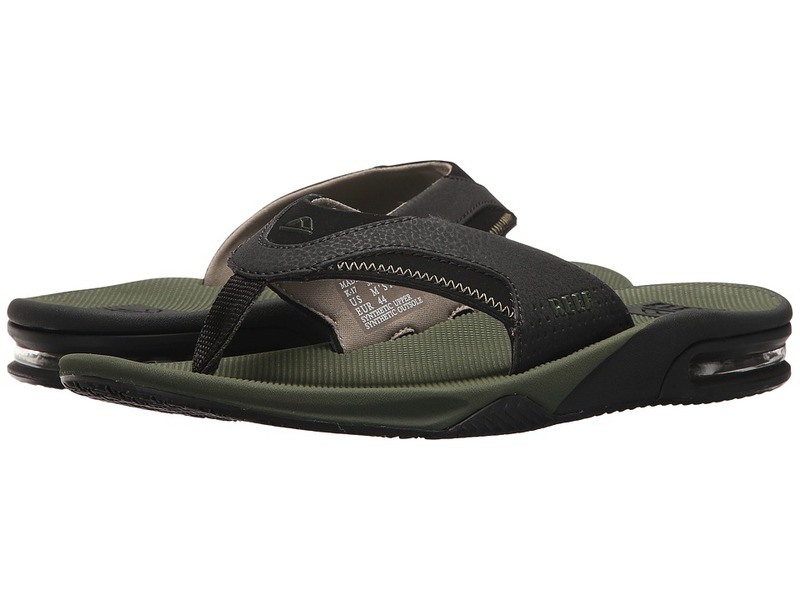 These Reef flip flops sport a comfortable, water friendly synthetic nubuck upper. Contoured compression molded EVA footbed with anatomical arch support. Full 360 degree heel airbag enclosed in soft polyurethane. Church key to open your soda bottle. Reef icon herringbone rubber outsole. Mick~s signature sandal. Patent pending. Measurements: Weight: 7 oz Product measurements were taken using size 7, width D - Medium. Please note that measurements may vary by size. Weight of footwear is based on single item, not the pair. 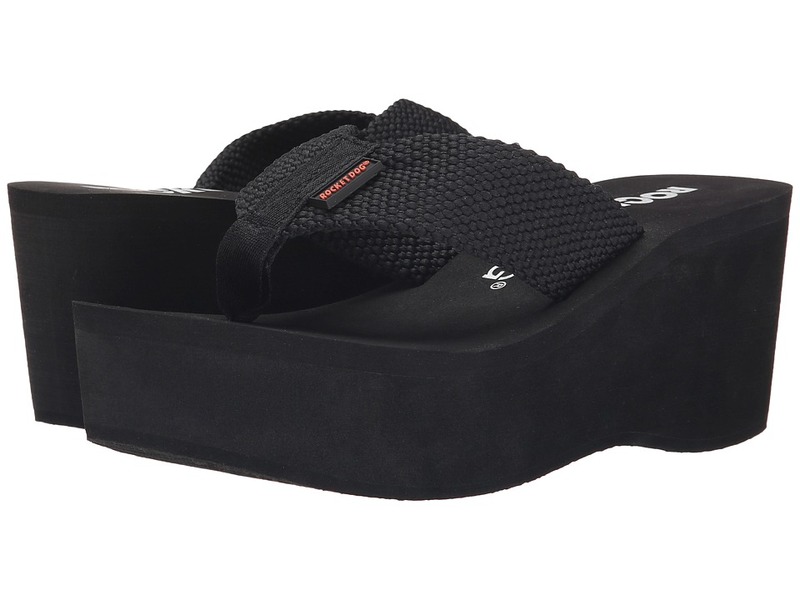 The classic Fanning silhouette is redefined in these Reef sandals. 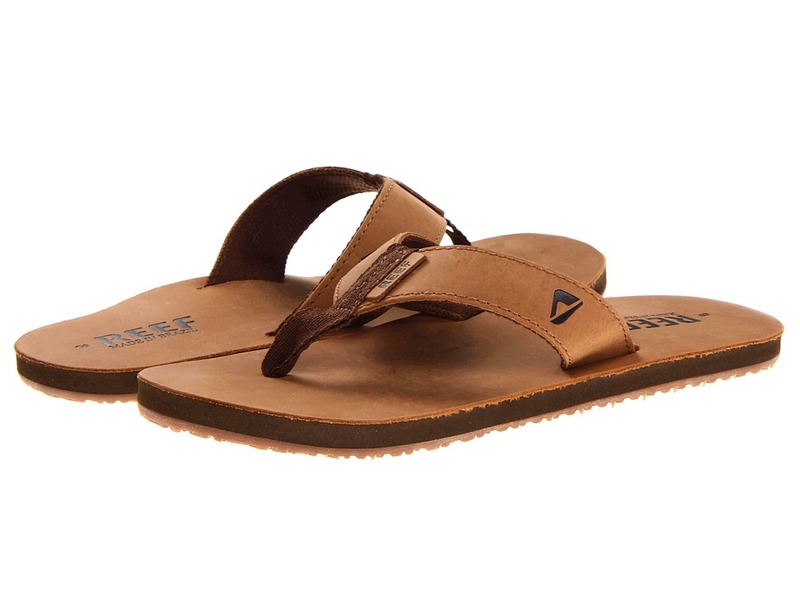 These Reef flip flops feature a nubuck and full-grain leather upper. Soft glove leather lining. Contoured compression molded EVA footbed with anatomical arch support. Full 360 degree heel airbag enclosed in soft polyurethane. Church key to open your soda bottle. Reef icon herringbone rubber outsole. Mick~s signature sandal. Patent pending. Measurements: Weight: 10 oz Product measurements were taken using size 7, width D - Medium. Please note that measurements may vary by size. Weight of footwear is based on single item, not the pair. 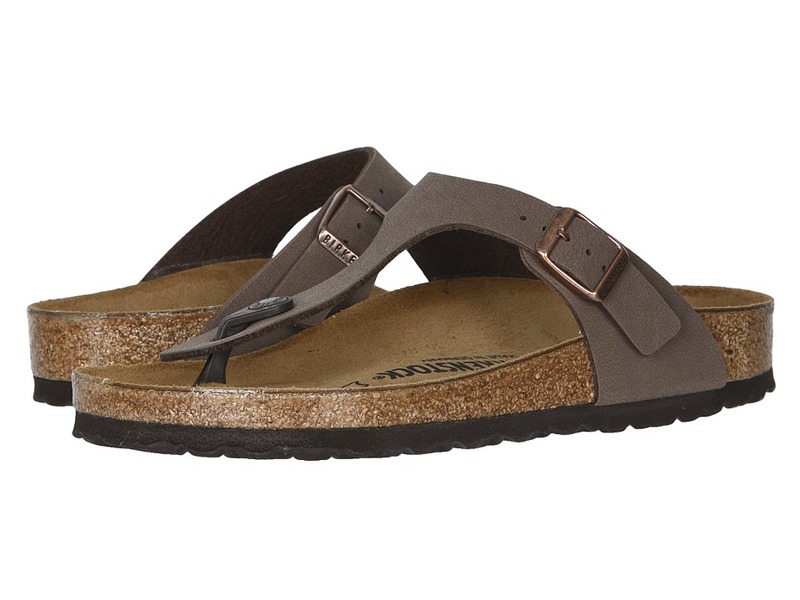 The Reef Leather Smoothy sandals were made for the beach, sand, and sun! 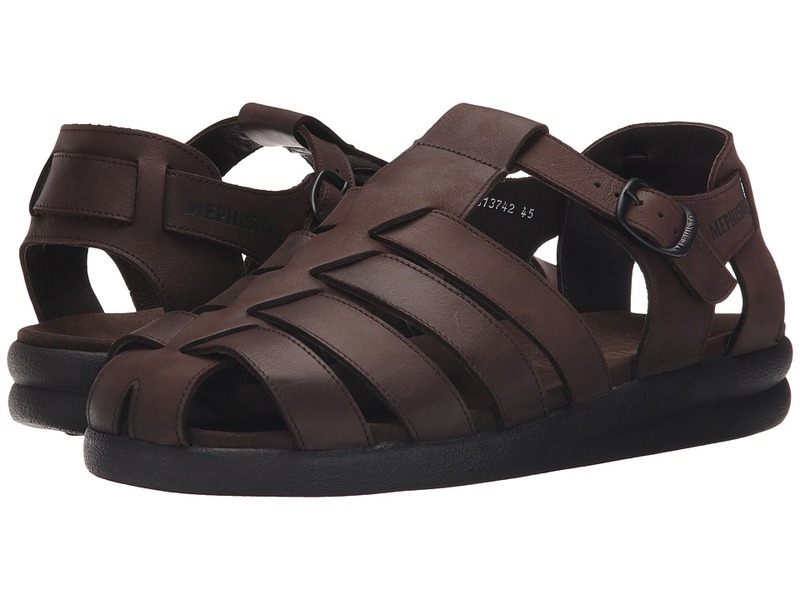 Bronze/Brown: Some stock will have Made in Brazil embossed on the footbed depending on origin. 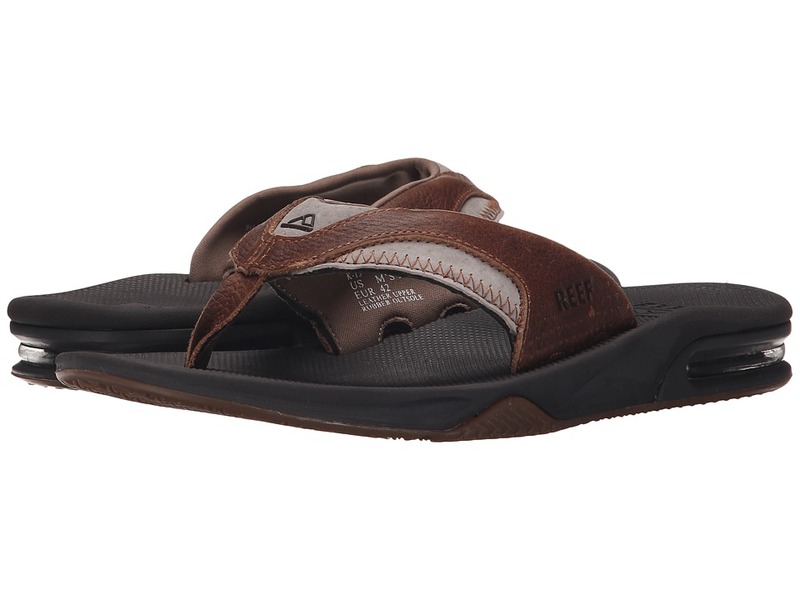 Fresh and clean, these slick Reef flip-flops have a high quality leather upper with woven lining. Reef-Flex triple density EVA construction with anatomical arch support. Leather footbed. Lightweight, high rebound EVA midsole. Durable and grippy high density EVA outsole. Imported. Measurements: Weight: 5 oz Product measurements were taken using size 10, width D - Medium. Please note that measurements may vary by size. Weight of footwear is based on a single item, not a pair. 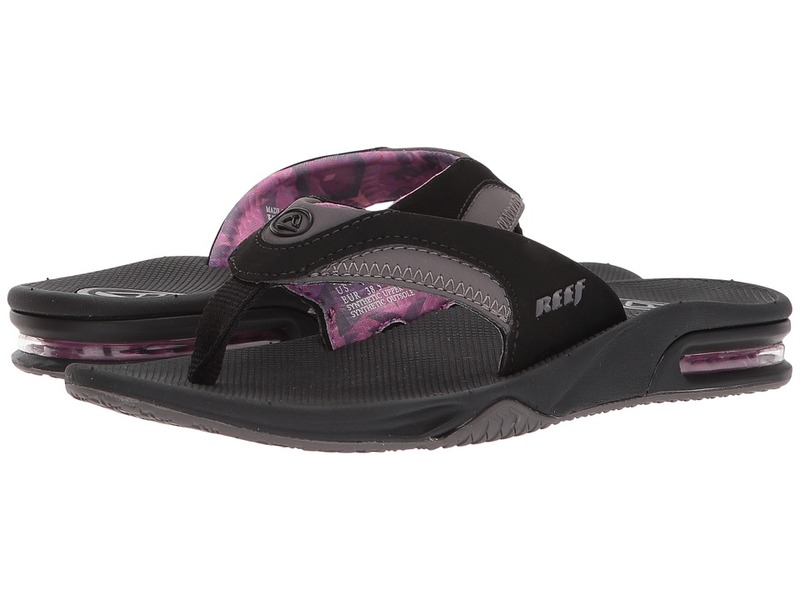 Reef sandals will always set the beach ablaze, especially with the beachside sheen of the Fanning W! Water friendly synthetic nubuck upper. Contoured CMEVA footbed. Full 360 degree heel airbag enclosed in soft polyurethane. Church key to open your soda bottle. Reef icon herringbone rubber outsole. Mick~s signature sandal. Measurements: Weight: 7 oz Product measurements were taken using size 7, width B - Medium. Please note that measurements may vary by size. Weight of footwear is based on a single item, not a pair. Performance sports sandal in a fresh design. Nubuck leather upper with stretch fit textile lining. Dual density footbed for added comfort. Direct injected PU midsole featuring full length Receptor Technology. Flexible rubber outsole. Measurements: Weight: 13 oz Product measurements were taken using size 43 (US Men~s 9-9.5), width D - Medium. Please note that measurements may vary by size. Weight of footwear is based on a single item, not a pair. 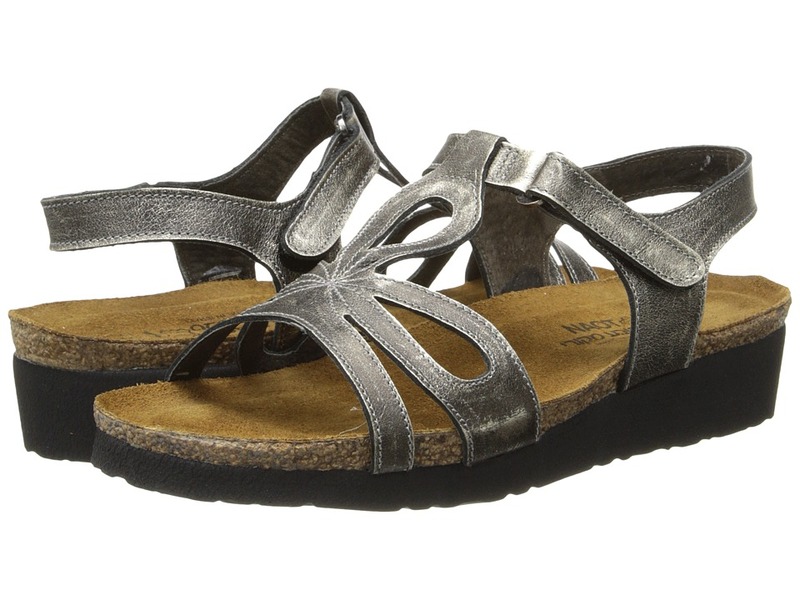 Casual and comfort in a classic style sandal. Leather uppers are made with the finest full-grain leathers for ultimate breath ability and durability. Buckle closure for an adjustable fit. Full latex foot bed for added comfort. 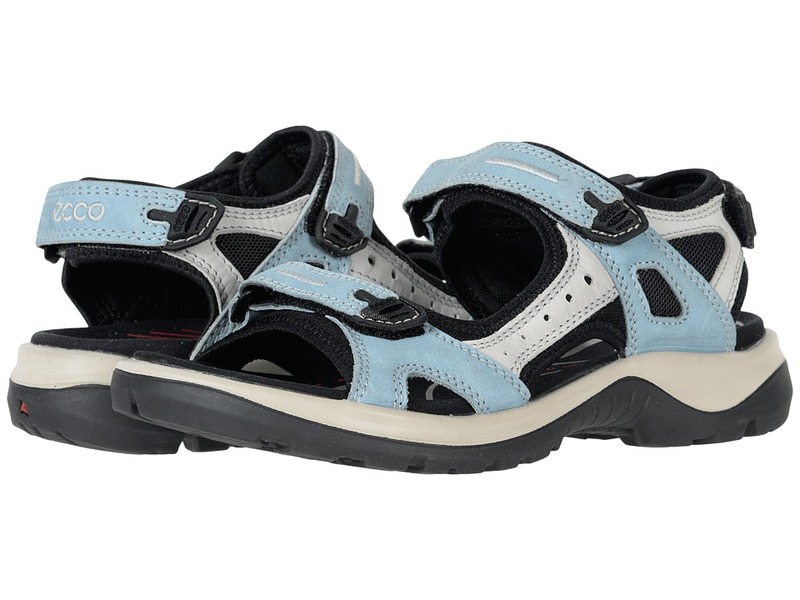 Shock absorbing system specially designed to reduce the jarring effects of walking. Measurements: Weight: 9 oz Product measurements were taken using size 42 (US Men~s 8), width D - Medium. Please note that measurements may vary by size. Weight of footwear is based on single item, not the pair. Please be advised that the Birkenstock&amp#174 Narrow width accommodates both traditional narrow and medium widths. Understanding Widths: The Regular icon (outlined foot) accommodates Regular to Wide. The Narrow icon (filled in foot) accommodates Narrow to Regular widths. 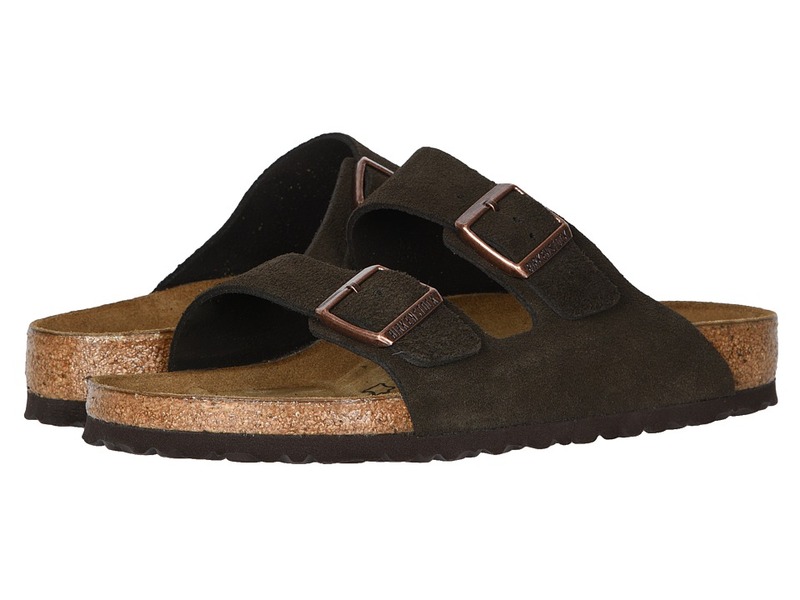 Classic Birkenstock sandal crafted in soft suede and featuring adjustable straps to ensure a great fit. Anatomically correct cork footbed, crafted from cork that is 100 percent renewable and sustainable, encourages foot health. The suede lined, contoured footbed will mold to the shape of your foot creating a custom footbed that supports and cradles you each and every step. Raised toe bar is designed to encourage the natural gripping motion of your feet, exercising your legs and aiding circulation. Neutral heel profile and deep heel cup keeps the natural padding of your foot where it belongs, under the heel, distributing your body weight more evenly. Flexible EVA outsole offers lightweight, shock absorbing support with lasting durability. Dual layer Jute: top wicks away moisture while the bottom adds strength and makes resoling easy. Heat Warning - Cork footbeds or EVA soles can be damaged by exposure to concentrated heat. Do not leave your footwear in direct sunlight or in closed cars on warm days. If your footwear becomes wet, allow it to air dry slowly, away from direct heat. Made in Germany. Measurements: Heel Height: 1 2 in Weight: 11.1 oz Platform Height: 1 4 in Product measurements were taken using size 46 (US Men~s 13-13.5), width Narrow. Please note that measurements may vary by size. Weight of footwear is based on single item, not the pair. 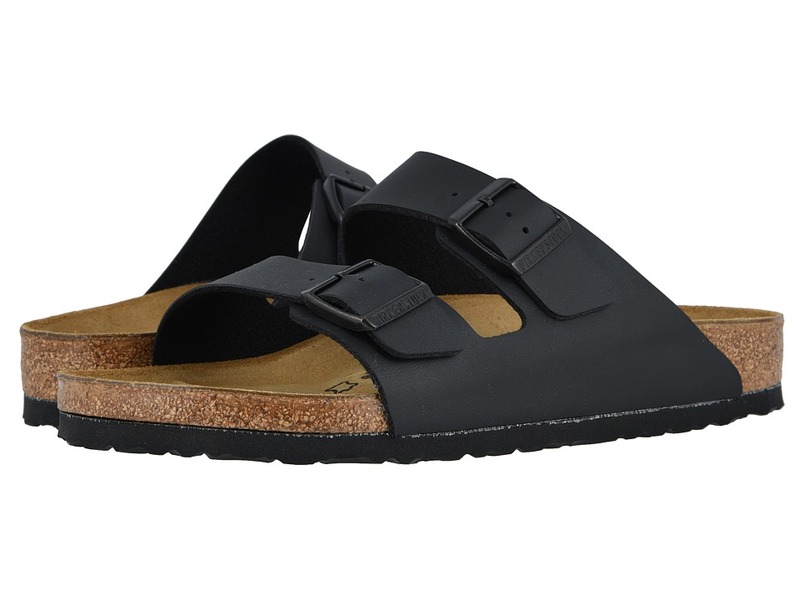 Please be advised that the Birkenstock&amp#174 Narrow width accommodates both traditional narrow and medium widths. The Gizeh (Birkbuc) is a fashionable thong with an adjustable strap for that perfect fit. Birkbuc upper is made from acrylic and polyamide felt fibers. This material offers a textured finish that looks and feels like velvety nubuck. Anatomically correct cork footbed, crafted from cork that is 100 percent renewable and sustainable, encourages foot health. The suede lined, contoured footbed will mold to the shape of your foot creating a custom footbed that supports and cradles you each and every step. Raised toe bar is designed to encourage the natural gripping motion of your feet, exercising your legs and aiding circulation. Neutral heel profile and deep heel cup keeps the natural padding of your foot where it belongs, under the heel, distributing your body weight more evenly. Flexible EVA outsole offers lightweight, shock absorbing support with lasting durability. Dual layer Jute: top wicks away moisture while the bottom adds strength and makes resoling easy. You will enjoy your Birkenstocks for years because they can be repaired, resoled or even completely renewed. Heat Warning - Cork footbeds or EVA soles can be damaged by exposure to concentrated heat. Do not leave your footwear in direct sunlight or in closed cars on warm days. If your footwear becomes wet, allow it to air dry slowly, away from direct heat. Made in Germany. Measurements: Weight: 6 oz Product measurements were taken using size 37 (US Women~s 6-6.5), width Regular. Please note that measurements may vary by size. Weight of footwear is based on single item, not the pair.